← Are authors earning more or less with Kindle Unlimited? A new trend in self-publishing is to create a boxed set. More books for the buck. Could include bonus content, too. Sell more books. Lose the risk of customers buying just one book. Lure more readers. The boxed set value may attract new customers. You might not reap the benefits that you’re hoping for. The sales ranks of the individual volumes may plummet if the boxed set takes off. If you already have many reviews and stable sales ranks with the individual volumes, realize that you’re basically starting over with the boxed set. The file size of the boxed set may be huge, adding download time for customers and a delivery charge for authors. If you want to create a boxed set, you’ll have to format it. In print, it won’t be easy to create a boxed set with an actual box. You probably won’t find a print-on-demand service that offers this option. You can order author copies of individual volumes, box them up yourself, and sell them at Amazon through Advantage. But then you need to design and order boxes, which cost money, and Advantage takes a significant commission from the sale. It may not be economical to try this. Lightning Source offers (or at least they did—you might want to submit an inquiry) a boxed set option, but they simply shrinkwrap your books together—there isn’t an actual box. An alternative is to combine all the volumes into one mammoth paperback. This won’t be feasible if you have an epic fantasy where each volume already has several hundred pages. At CreateSpace, for example, you can have up to 828 pages on white paper (less in cream), but only in selected trim sizes. 7″ x 10″ or 7.5″ x 9.25″ accommodate up to 828 pages (or 740 pages if you choose cream). If you have a color interior, it’s even less (480 in most trim sizes). You may want to increase the page size. For example, if your individual volumes are 5″ x 8″, you can reduce the overall page count for the omnibus by using a significantly larger trim size. But if you choose the largest trim size, 8.5″ x 11″, you can only go up to 630 pages. Less leading (space between lines). Consolidate front and back matter, especially material that’s repeated. Reformat the page header or page numbers, and the space between these and the body text, to make more room for the body text. Remove any repeated images. Reduce the size of images. Note: If you have manual hyphens or if you made manual adjustments to correct for widows and orphans, this will all need to be redone if you change the font, margins, trim size, leading, etc. But you can take this too far. You don’t want to louse up the reading experience just to make your boxed set fit into a single mammoth printed book. You can, however, experiment with these features and see if any combination will provide the right balance, fairly preserving the reading experience while also helping it fit. Another thing you’ll have to do is renumber the pages for a single-volume boxed set. This gets more tedious if each volume has an index (in which case you must also decide if you want to consolidate your indices into a single index for the boxed set). Also, if you have page references (e.g. “See page 364”) you’ll need to update those. 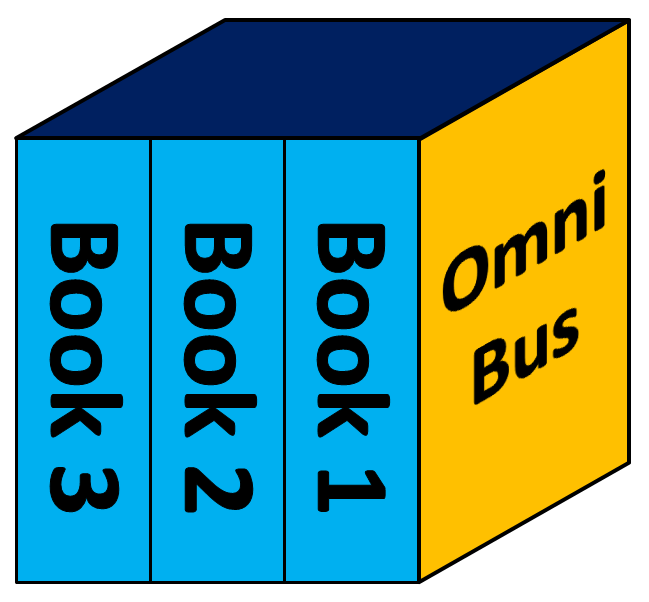 For most fiction, where an omnibus is quite common, this isn’t likely to be an issue. Page count isn’t an issue for an e-book omnibus. But if you have many images, the maximum file size and delivery charges may come into play. Kindle’s maximum file size has been quite generously extended (650 MB). Thanks, Chris. I hadn’t thought of combining my three print books into one. I’m saving this page for future reference! Is it still difficult to produce a paperback version of a boxed set? Would Amazon do it? Createspace and KDP print don’t offer an option to self-publish a package of books (but you could create a compilation volume with multiple books put together in a single large book, but only if the total page count doesn’t exceed the maximum page count for the intended trim size). If you print (or order author copies) and package them together yourself in a boxed set, you can sell that on Amazon through Advantage (for example). Scroll down to the bottom of Amazon’s home page. The second column is called Make Money with Us. Click “see all” at the bottom of that column. Now look for Selling Online (in orange). Two ways to sell your own products on Amazon include Amazon Fulfillment and Amazon Advantage. Click the learn more link below Amazon Advantage. Many small publishers sell books with this method. It’s not as good as print on demand, but is a viable way to sell a boxed set — IF you can sell enough copies to make it worthwhile.